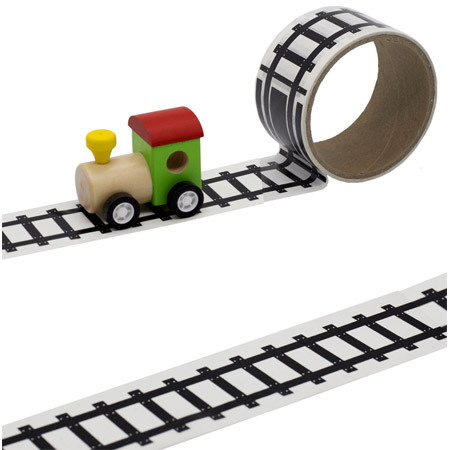 Wooden Train With Track Tape is a brilliant toy that will inspire hours of creative play. This little Train comes with an 8 metre roll of 5cm wide tape which can be stuck down on a clean surface and then peeled back off and placed back onto the roll. Now your little ones can make rail tracks all over the floor and take the train on all sorts of journies and adventures. All aboard... this is a wonderful toy. Material: Wood with Child safe paint. Reusable Removable sticking tape. We like this because: "A very cool idea." I purchased the wooden road signs for my grandson. The shopping experience was perfect and I received updates all along the purchase timeline. 2 days to delivery! WA to QLD. The product quality and quality packaging presentation superior and a pleasure to give as a gift. Will be doing more My Wooden Toys shopping for my grandson!